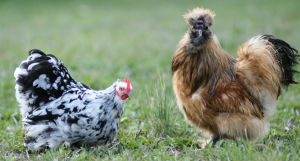 At what age can Bantams chicks go outside? 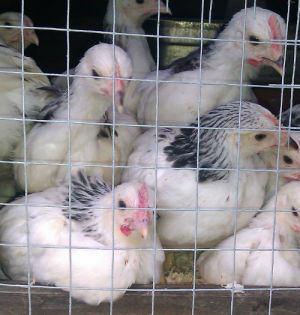 In general if the weather is warm and sunny then any chicks, bantams included can go outside from day 2. As soon as they are dry and fluffy they can spend a few minutes outside. Use a cardboard ring with a little food and water and let them explore. Watch them all the time they are out and bring them back in at the first loud cheep. 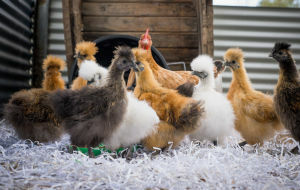 Bantam Chicks can be moved permanently to an outside coop from 6 weeks of age, provided they are fully feathered and the coop is sheltered, free from draughts and dry. I have found that bantams may need an extra week or two in the brooder or with a heat lamp mostly because of the small size. 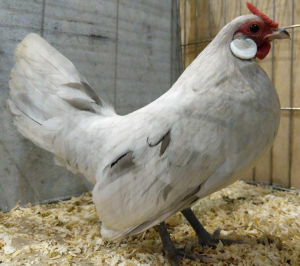 Below: Chicks will often let you know when they are ready. By 12 weeks old they should be able to have full access to the run and pen even in colder conditions. When they are younger than this if they get wet, their feathers and down lose all of their insulating properties, and they can get chilled. If you do put them out, make sure they are protected from wind and kept dry. 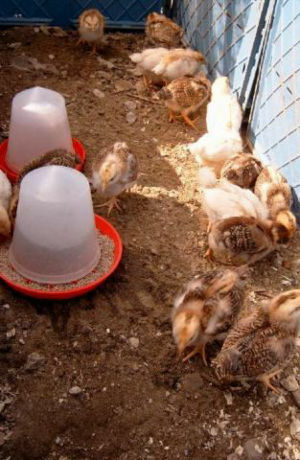 Acclimatisation of young chickens is a gradual process best accomplished in stages. Start with a few minutes, then half an hour, then afternoons and then the whole day and night. When Can Chicks go Outside for Short Trips? If you watch the way a mother hen deals with her chicks she will brood them for a while then they will wander off as a family and eat, drink and investigate while she teaches them to scratch and find tasty morsels. When the chicks begin to cheep loudly that they are cold she will call them back into her feathers for another warm up session. Below: this is some of my barevelders outside at 7 days old. And so it goes on with the chicks spending longer and longer away from the mother hen over the course of the next 6 to 8 weeks when she will return to her roost. they should eventually follow her after a night or two in a bleating heap in the corner of the broody coop. So if you have 2 to 6 week old bantams, or even large fowl chicks, and would like to get them outside but are worried they are too little, then don't be. I would take them out for a short while as long as it is above 60 degrees or so. Start with 15 minutes then wait a day, and take them out again weather permitting, for 30 minutes the next day. They will let you know if they are cold, they will bleat and huddle and when I took my silkies out the first time they a mad 15 minutes running around the playpen on the grass in the sunshine and then ran back to me after a while to go back to the brooder. Personally I do not, nor will I ever ever again, use a heat lamp after I had one start a fire. I don't like the fire risk and they a very strong, artificial heat. I'm also not convinced that chicks should have light 24 hours a day, they would after all be in the dark under a hen for around 12 hours overnight. They make a lot of and dander and then there is the 24 hour cheeping in the house. You should if at all possible use a garage, outhouse, shed or coop for the purpose of raising chicks. From their first day, mine head for the heating pad and suspended mop heads to simulate the mother hen and mine head under as the sun goes down and they sleep all night long, not getting up until the sun comes back up. It's a close to having a broody hen raise them as I can get. Moving to the outside coop permanently? Move them all at one time. They are flock animals so separation is not advised. They are an integrated group at the moment and the separation would break the pecking order and could cause problems when put back together. 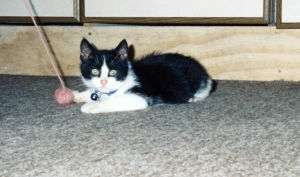 Young birds are especially vulnerable to predators so take extra care with dogs, cats, hawks and even snakes and rats. 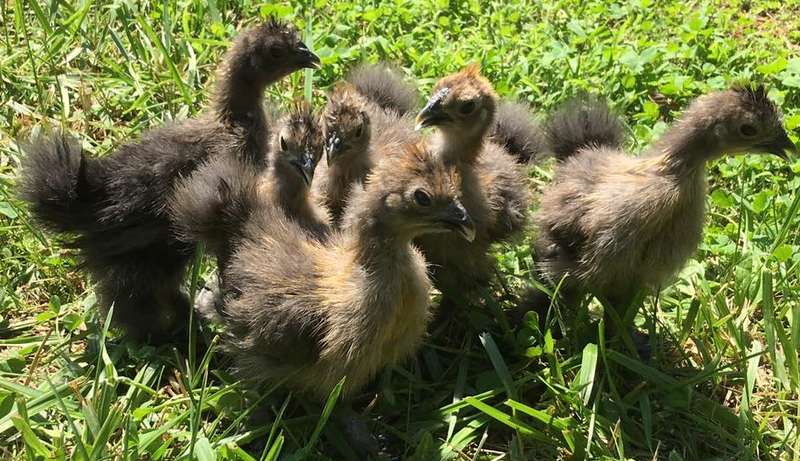 When Can Chicks Join the Flock? Chicken society is based on bullying and if you watch a mother hen you will see that she protects her chicks from other flock members. It takes a bold chicken to mess with a mother hens, the can be ferocious. In the case of chicks raised by humans, we have removed this protective barrier and it can be problematic when integrating a group of youngsters into the flock. I start looking to introduce the new chicks to the flock from about 6 to 8 weeks. The first stage is to have them next to each other so they can see hear and smell the other birds but not fight.